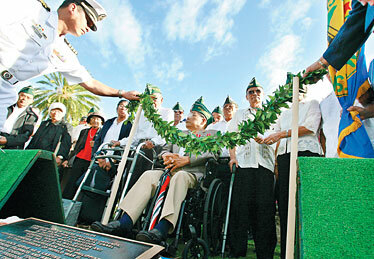 World War II Filipino-American veterans and others stood by as a maile lei was placed upon a memorial to honor the service of Filipino, American and other Allied defenders of Bataan and Corregidor during World War II. The ceremony was held as part of Araw ng Kagitingan, or Day of Valor, at the National Memorial Cemetery of the Pacific in Punchbowl yesterday. Captain Severino Vicente David of the Philippine Navy held the lei for the ceremony. 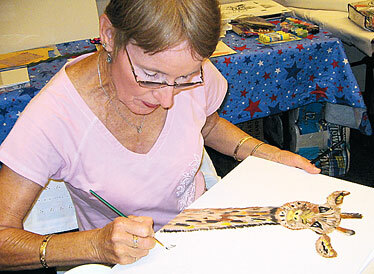 Cancer patient and animal lover Mary Griffin painted a giraffe yesterday from a photo she took when visiting the zoo. She is participating in Kaiser Permanente's Oncology on Canvas program that gives cancer patients a chance to express their journey through art. 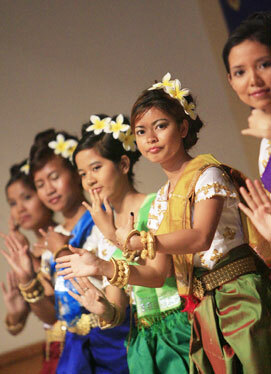 Dancers from the Cambodian Community of Hawaii and the Cambodian Club of Brigham Young University-Hawaii danced with Cambodian textiles, symbolizing the Seven Colors for Seven Days, during a Cambodian New Year's celebration yesterday at Central Union Church.